NFL 2012: How daytime football games became primetime football games. How daytime football games became primetime football games. 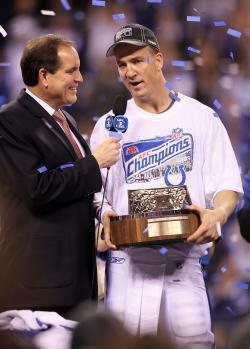 CBS’ Jim Nantz interviews Peyton Manning after the Colts won the AFC Championship Game in 2010. Photo by Andy Lyons/Getty Images. This week, CBS finally conceded or embraced a fact that everyone had been pretending to ignore: During football season, 60 Minutes does not start at 7 p.m. From now through the end of the season, the Sunday evening lineup on CBS is officially scheduled to start at 7:30. Sunday afternoon football has been creeping into primetime hours for a long time now. For decades, the 4 p.m. games began right after the hour: introduction, blimp shot, a word from Schlitz, and there was the kickoff team. But in 1998, when CBS paid $4 billion over eight years to get back into NFL coverage after a four-year absence, some kickoffs moved to 4:15—“to allow for an extra two-minute TV timeout,” USA Today reported at the time. This year, for selected games, kickoffs are scheduled as late as 4:25. The old six-hour NFL afternoon is gone forever. In Week 1 this year, games averaged 3 hours and 14 minutes. That was about six minutes longer than last year’s opening-week games. Some of the bloat has to do with the dilatory antics of the replacement referees, but that’s not the lone cause. For all of last season, according to the Elias Sports Bureau, the average game lasted 3:07. That was a minute longer than 2010, which was a minute longer than 2009, which was two minutes longer than 2008. There are plenty of explanations. We have challenge flags and automatic booth reviews to interrupt the game now. Or you can look for theories in game dynamics, like the rise of the passing offense, with more flags to protect quarterbacks and fewer clock-grinding running plays. It’s probably all of those things and more. Average game length has bounced up and down through the decades. According to Elias, it was a ponderous 3:10 in 2002, and a brisk 2:59 in 1992. But CBS’s decision to rewrite the whole TV schedule reminds us that the real question isn’t why games may be getting longer—it’s what incentive anyone has to try to make them shorter. As it is, a football broadcast consists of 11 minutes of actual football, surrounded by nearly three hours of everything else. And that ratio of padding to action hasn’t kept the games from being wildly popular television programs. So while baseball frets about driving viewers away with draggy action, the NFL—despite its play clocks and game clocks—is free to sprawl. Longer games are better business. Automatic booth review? Squeeze in another commercial. Not that CBS was especially unhappy to have more minutes of football included in its Sunday prime-time numbers. “It may be a pain but we’ll take a 17 rating for football every week,” [CBS chief scheduler Kelly] Kahl said. And since? Despite the fact that the deals keep getting bigger and bigger, the NFL has gone from that expected $150 million loss to something where real profits are within reach for broadcasters. NBC itself came running back to the NFL in 2006. So the Sunday afternoon games are now officially primetime programming. The fourth quarter goes right through dinnertime. This won’t change. And we really, really don’t seem to mind.